March 26 marks the birthday of four-time Pulitzer Prize-winnng poet Robert Frost, who, although a man of the twentieth century, wrote poems evoking traditional, rural New England landscapes of another time. His poetry recalls a simpler era, and yet Frost conveys the quiet strength of everyday Americans that continues to inspire. Events across the country will commemorate the day, but one in particular stands out - the inaugural Mending Wall Day, organized by Lowell, Massachusetts-based stoneware studio, American Stonecraft. The event is named for the Frost poem “Mending Wall,” which recounts how fieldstones push their way through the dirt during the winter months. Traditionally, once the snow melted, hardy New England farmers would move the rocks out of their fields in preparation for planting. Since farmers are resourceful folk, these stones were used to build the walls that grace hundreds of fields and backyards from Connecticut to Maine. (In an informative essay on Earthmagazine.org, John-Manuel Andriote explains the history and singularity of New England rocks, estimating that 380,000 miles of stonewalls zigzag throughout the region.) That rite of passage continues every spring on farms throughout New England. The Mending Wall Day project is the brainchild of Groton, MA, native Gerald Croteau III, a former D.C-based mergers and acquisitions consultant who switched careers after a visit to the family farm in the Merrimack valley. “I looked at a fieldstone split open, and all the beautiful colors inside that rock, that’s all it took. I left my old job, moved back to Massachusetts, and set up shop,” he said. 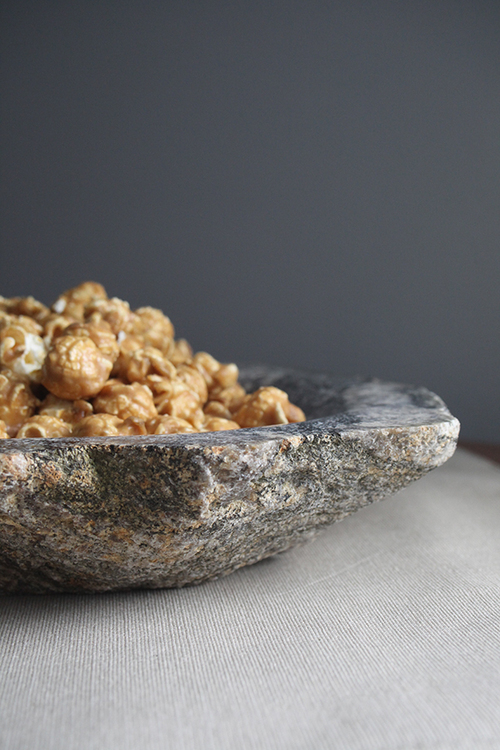 Four years later, American Stonecraft partners with local farmers by using their freshly unearthed stones to make custom tableware such as coasters and bowls (called ‘bowlders’ on American Stonecraft’s site). Each unique piece is labeled with the farm of origin, recounting via multicolored striations the time-worn tale of these rocks, and the farmers who put them to good use. Now, the company’s tableware are the vessels for culinary delights at chef Dan Barber’s upscale farm-to table restaurant Blue Hill at Stone Barns in Tarrytown, New York. Fieldstones from the restaurant’s adjoining farm provided the raw material for the distinctive serving ware. Mending Wall Day’s inaugural goals are modest, but laudable. “We want to increase cultural awareness of New England stonewalls by organizing independent community gatherings like this one, where neighbors gather to rebuild and tend to fieldstone walls,” explained Croteau during a telephone conversation from his Congress Street studio overlooking an historic canal in Lowell, Massachusetts. Croteau’s choice of studio location also reflects his commitment to community. “Lowell has the most working artists per capita in America.” Also known as the Mill City, Lowell is experiencing a renaissance of sorts, thanks to a dedicated group of artists, musicians and entrepreneurs who are transforming formerly abandoned mills and storefronts into thriving galleries, studios, showrooms and restaurants. “It feels like Boston’s Brooklyn,” Croteau mused. Sure, plenty of neighborhoods still resemble hardscrabble scenes from the film The Fighter but things are looking up for the resilient, resourceful people of Lowell. This year the Mending Wall Day event is being held on Thursday, March 26, in the nearby rural town of Dunstable. Croteau’s group will collect rocks from the 350-acre Tully Farm, a family-run operation since 1873 whose herd of cows provide milk to nearby cheese making cooperative Cabot. Though he’s not expecting a large turnout--eight Stonecraft employees, (a number of whom hail from Frost’s childhood hometown of Lawrence) plus Tully farmers-- Croteau is optimistic about what the future holds. “Mending Wall Day is about finding the balance between city life and country life, and I’m hopeful that if people hear about our work this year, then maybe next year they’ll join us. It only takes one to start a movement.” One stone at a time, good fences continue to make good neighbors. Events across the country will commemorate the day, but one in particular stands out - the inaugural Mending Wall Day, organized by Lowell, Massachusetts-based stoneware studio, American Stonecraft. The event is named for the Frost poem "Mending Wall," which recounts how fieldstones push their way through the dirt during the winter months. Traditionally, once the snow melted, hardy New England farmers would move the rocks out of their fields in preparation for planting. 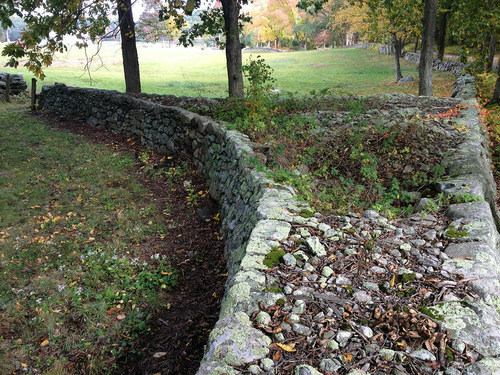 Since farmers are resourceful folk, these stones were used to build the walls that grace hundreds of fields and backyards from Connecticut to Maine. (In an informative essay on Earthmagazine.org, John-Manuel Andriote explains the history and singularity of New England rocks, estimating that 380,000 miles of stonewalls zigzag throughout the region.) That rite of passage continues every spring on farms throughout New England. The Mending Wall Day project is the brainchild of Groton, MA, native Gerald Croteau III, a former D.C-based mergers and acquisitions consultant who switched careers after a visit to the family farm in the Merrimack valley. "I looked at a fieldstone split open, and all the beautiful colors inside that rock, that's all it took. I left my old job, moved back to Massachusetts, and set up shop," he said. Four years later, American Stonecraft partners with local farmers by using their freshly unearthed stones to make custom tableware such as coasters and bowls (called 'bowlders' on American Stonecraft's site). Each unique piece is labeled with the farm of origin, recounting via multicolored striations the time-worn tale of these rocks, and the farmers who put them to good use. Now, the company's tableware are the vessels for culinary delights at chef Dan Barber's upscale farm-to table restaurant Blue Hill at Stone Barns in Tarrytown, New York. Fieldstones from the restaurant's adjoining farm provided the raw material for the distinctive serving ware. Mending Wall Day's inaugural goals are modest, but laudable. "We want to increase cultural awareness of New England stonewalls by organizing independent community gatherings like this one, where neighbors gather to rebuild and tend to fieldstone walls," explained Croteau during a telephone conversation from his Congress Street studio overlooking an historic canal in Lowell, Massachusetts. Croteau's choice of studio location also reflects his commitment to community. "Lowell has the most working artists per capita in America." Also known as the Mill City, Lowell is experiencing a renaissance of sorts, thanks to a dedicated group of artists, musicians and entrepreneurs who are transforming formerly abandoned mills and storefronts into thriving galleries, studios, showrooms and restaurants. "It feels like Boston's Brooklyn," Croteau mused. Sure, plenty of neighborhoods still resemble hardscrabble scenes from the film The Fighter but things are looking up for the resilient, resourceful people of Lowell. This year the Mending Wall Day event is being held on Thursday, March 26, in the nearby rural town of Dunstable. Croteau's group will collect rocks from the 350-acre Tully Farm, a family-run operation since 1873 whose herd of cows provide milk to nearby cheese making cooperative Cabot. Though he's not expecting a large turnout--eight Stonecraft employees, (a number of whom hail from Frost's childhood hometown of Lawrence) plus Tully farmers-- Croteau is optimistic about what the future holds. "Mending Wall Day is about finding the balance between city life and country life, and I'm hopeful that if people hear about our work this year, then maybe next year they'll join us. It only takes one to start a movement." One stone at a time, good fences continue to make good neighbors.